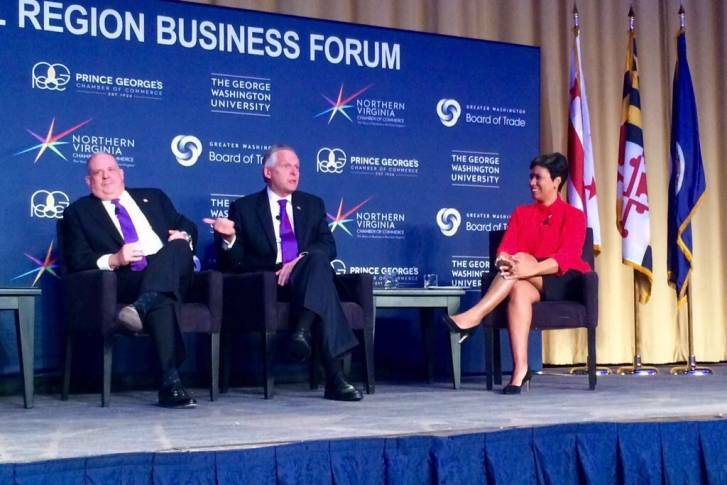 D.C. Mayor Muriel Bowser, Virginia Gov. Terry McAuliffe and Maryland Gov. Larry Hogan discussed the issue behind closed doors after touching on the topic at a public forum. WASHINGTON — The region’s top elected leaders gathered privately Wednesday and talked about the possibility of a sales tax that would be used as a dedicated funding source for the Metro system. D.C. Mayor Muriel Bowser, Virginia Gov. Terry McAuliffe and Maryland Gov. Larry Hogan discussed the issue behind closed doors after touching on the topic publicly during a forum at the Washington Hilton hotel. “Metro needs to make the investments, and we need to come up with, once and for all, a way to pay for it,” Bowser said during the forum. In the private meeting, the three leaders heard a presentation from District Chief Financial Officer Jeffrey DeWitt, who said a 1-cent regional sales tax could pay for Metro’s long-term funding needs, according to documents obtained by The Washington Post. The tax would raise about $500 million annually, the Post reported. Although the mayor was strongly supportive of such an idea, the governors both voiced opposition at the forum, saying they would need to see improvements in the Metro system before moving forward. Hogan took a similar stance. “This is, unfortunately, a system that has appeared to be broken for a long time,” he said, adding that his state already pitches in about $500 million annually for Metro. “At this point, that’s about as much as we’d like to spend until we can see some things improve,” said Hogan.